On our recent trip to Barcelona, I fell in love with the bakeries. Before that holiday, if I’d thought of pastry, Paris would immediately come to mind. And while I’m not even going to try to argue that this Spanish city could rival the French capital in its output of incredible confections, there are some seriously good places to try (I’ve listed my favourites at the end of this post). When visiting these bakeries for a morning pastry or simply for a good old nose (yes, I look up bakeries in advance the way other people might earmark an important museum or gallery), there were certain creations that we encountered time and again. Magdalenas, palmeras, polvorones (little, light almond biscuits) and alfajores, a biscuit that seemed to vary enormously depending on where we went. At its most basic, an alfajor is a spiced sugar biscuit made with flour, honey and almonds. Though of Arabic origin – their name is thought to be derived from the arabic word for honeycomb, alfahua – alfajores are popular throughout Spain, and have also travelled all the way to South America where the recipe has been realised in multiple adaptations, hence the variety we encountered on our trip. Having said that, the majority of alfajores that I found consisted of two lightly spiced biscuits sandwiched together with dulce de leche, and because there are few things more delicious than this milky-sweet sticky sister of condensed milk, it is these that I’ve used as loose inspiration for the recipe below. 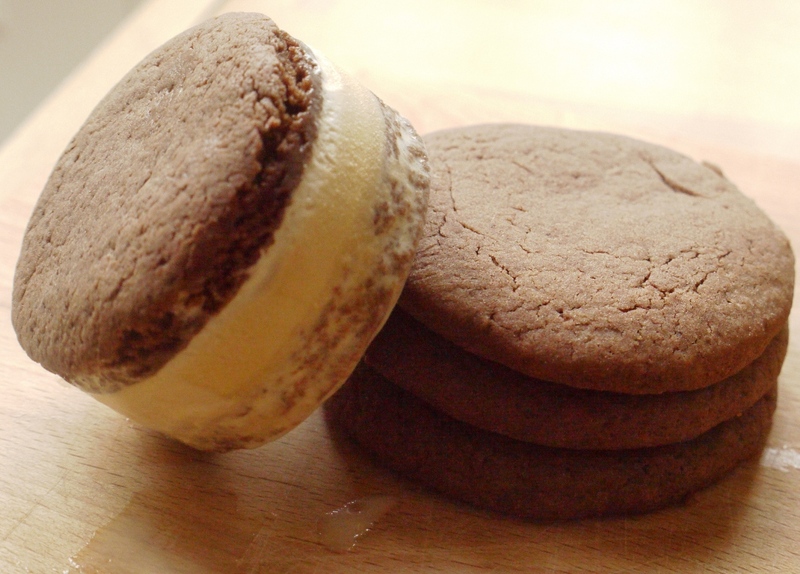 Rather than sandwiching the biscuits together with simple spread, I decided to make a more summery version, using dulce de leche ice cream as the filling instead. A quick search for this ice cream online took me to Deb’s lovely blog, and when I saw her photo of brownie roll out cookies in the very same post, I knew this slightly softer ice cream sandwich had to be made. The recipe below incorporates coffee, cocoa and runny honey to create an incredible cross between a brownie and a cookie; firm but slightly squishy, and the perfect texture with which to make an ice cream sandwich. Flavour-wise, the strong, chocolaty notes work wonderfully with the creamy caramel-like dulce de leche, while honey adds a round richness to the whole experience. I’ve omitted any spice from this recipe as my first batch included almond and cinnamon and slightly overpowered the whole eating experience, but if you’re using plain vanilla ice cream, or a fan of bigger, bolder flavours, do feel free to add a little spice to your cookies. A quick note on eating: you need to act fast. The ice cream will start to melt fairly quickly, so the passage from freezer to mouth needs to be a fairly swift one. Certainly they’d never survive on the shelves of a warm Spanish bakery. But some things are best kept to yourself, and once you’ve tried these ice cream sandwiches, it’s unlikely any leftovers will last long. Set a large bowl over an ice bath. In a medium saucepan, bring the milk and cream to a boil, removing from the heat as soon as it begins to bubble. Whisk in the dulce de leche until smooth, then pour the mixture into the bowl over the ice bath, whisking occasionally until cool. Chill the mixture in the fridge overnight, then churn in an ice cream maker. Scrape into a container and freeze. Combine the whiskey, coffee granules and vanilla extract in a small bowl. Set aside. Cream together the butter and sugars with an electric whisk until light and fluffy, about 2 minutes. Incorporate the eggs, one at a time, adding a scant teaspoon of the flour if your mixture starts to curdle. Add the honey, then your prepared coffee mixture and beat until just combined. Sift the flour, cocoa, baking powder and salt into your butter mixture and fold with a rubber spatula until the dough comes together. Press cling film directly onto the dough and pop in the fridge for 30 minutes to firm up. Preheat the oven to 175 degrees C and line two baking sheets with parchment paper. Remove the dough from the fridge. You can shape the cookies in two ways, depending how neat you want them to be. Either coat your fingers with flour and scoop 1 tablespoon portions of dough onto the baking sheets, patting down to form a flat round about 1cm thick or flour the work surface and very carefully roll the dough out, cutting with a cookie cutter. The dough is quite sticky so the latter is a bit risky, but will produce more perfect cookie rounds. Bake for around 10-12 minutes, or until the cookies appear dry on the surface. They will still be a little soft in the middle. Allow to cool completely. To assemble your sandwiches, again there are two methods. 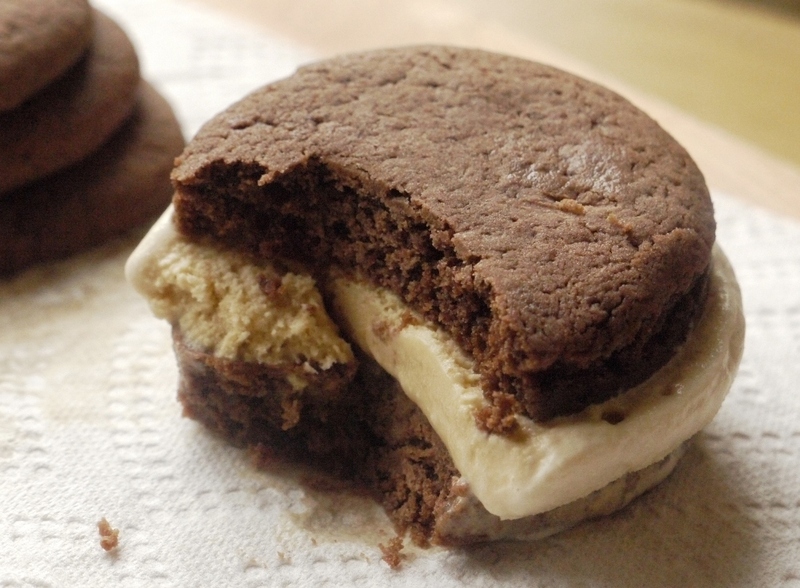 For a more rustic look, simply sandwich a large scoop of dulce de leche ice cream between two cookies. For something slightly neater, push one cookie to the bottom of a ring mould. Top with ice cream, pushing it down into all the cracks, then another cookie, and freeze until firm. Remove the ring and serve. Delicious on their own, or with an extra drizzle of dulce de leche on top. 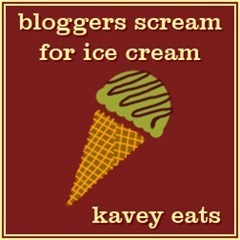 I’m entering this recipe into Kavey’s July Bloggers Scream for Ice Cream challenge as dulce de leche is made with condensed milk. Visit Kavey’s brilliant blog and find out more about the challenge here. 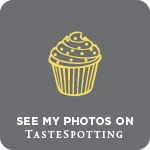 I love this post because a/I love visiting bakeries too, b/ I love that dulce de leche ice cream recipe and c/ I love alfajores. Oh yes, these look fabulous! I too can get more excited checking out a great bakery (or other food specialist shop) on holiday than another Important Historical Thing To Visit (and I love history) but I never bring back ideas as inspiration. Love your idea and thought processes and final result! Lovely post and these ‘sandwiches’ look amazing. My favorite kind of sandwich is the ice-cream kind, beats a ham and cheese any day of the week. Trying a large variety of baked goods is definitely an essential part of any holiday! I love your take on alfajores, I’m not sure you can really beat an ice cream sandwich for pure joy and enjoyment. 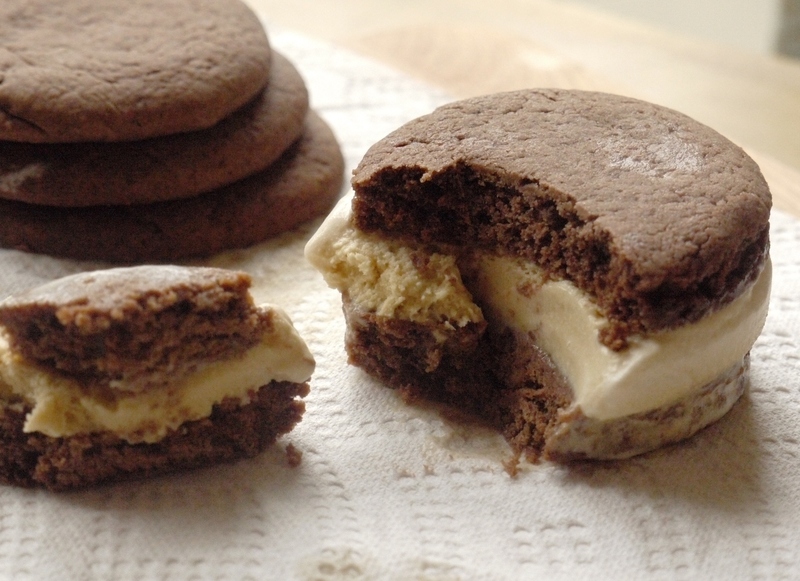 These ice cream sandwich cookies look phenomenal! These are so perfect. Your ice cream is so neat! I am envious of your skills with it! 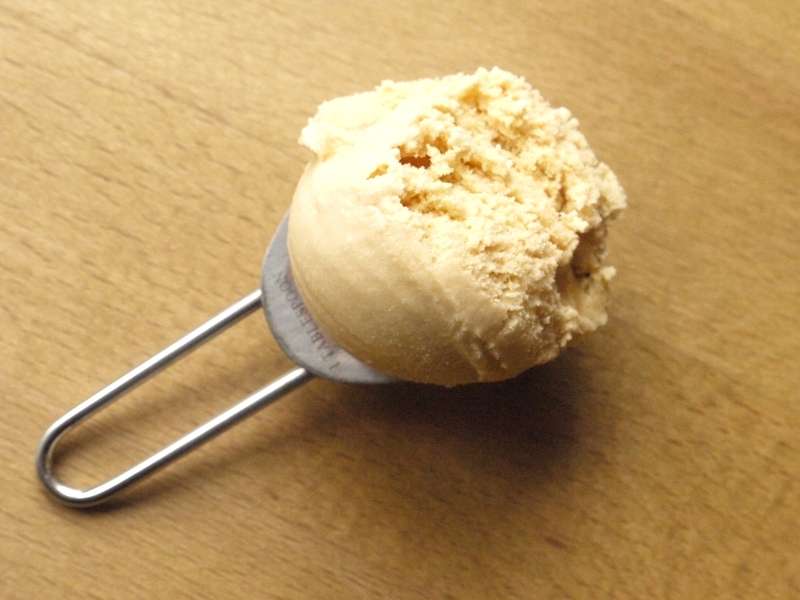 I must try the ice cream at least as I made dulce de leche recently (in the oven. So easy!) and have so much of the stuff I don’t quite know what to do with it! Oh, the biscuits sounds great – and the ice cream sandwiches in general – yum yum! Barcelona – I really want to visit – I’ve only heard great things about the city food and pastry-wise! Emma – that’s a whole lot of love 🙂 So glad you like them. Kathryn – I love a good scoop of ice cream, but sometimes only a sandwich will do. North South Food – isn’t dulce de leche amazing? I’m sure you’ll find ways to use it all up very quickly! Jenni – you have to go. Try to visit Tickets if you do – it’s Ferran Adria’s tapas bar and the hot and cold doughnuts are out of this world. 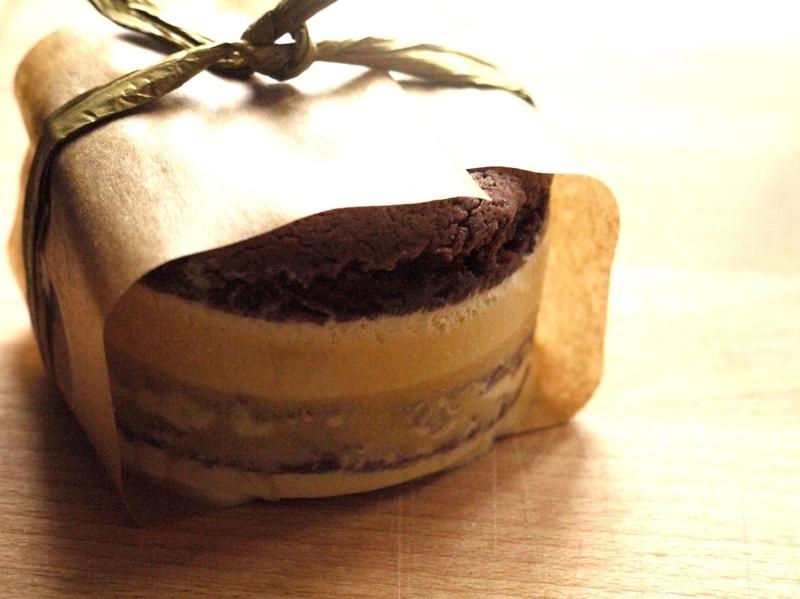 I adore alfajores but truly, I’m sure I’d love them even more as ice cream sandwiches! Delicious idea! I love visiting bakeries too – discovering what they do really well. I miss the bakery I used to live above in Bristol. These look really, REALLY good. Absolutely delicious, Loaf. Love love love these, they look so good. I’d be perfectly happy with a holiday that involved visiting lots of bakeries. Oh my god this may be one of the tastiest things I think you’ve ever posted—and that’s saying something! These look so impressive, I love that cookie base. Next time I make ice cream sandwiches I’m going to use these cookies. Love the brownie-like texture. Oh gosh, in Buenos Aires, dulce de leche ice cream (or ‘helado’ rather) is an art form! At every heladeria, there were always at least five flavors… definitely one of my favorite culinary discoveries. These sound so good! All I want to do these days is toss together a salad and call it done. You’re awesome. Frugal Feeding – nothing beats a good bakery visit! Laura – it’s fab, although dangerous to combine bakery trips with beach visits if you want to keep your bikini body in shape 😉 Haha. Amy – the brownie texture was a revelation. Totally fell in love with these cookies. Lorraine – ooh, jealous, I’d love to go to Buenos Aires! Zita – aw, thank you. Oh, my. I love alfajores, but I think I’d like this better — there’s ice cream involved! Trying out a new bakery is also one of my favorite things to do. I’m always crippled with indecision, though. Like you said, it’s so hard not try everything. wow, this cookies look so delicious! I love Bakery! Nice to meet you, I am Letizia. These look fantastic! My kind of sandwich! Terra – glad you like them! Lottie – haha, me too.